Love alternate universes! Sliding Doors was such a good movie and it is a great plot to see how one choice can change your whole future. I also love parallel universe stories, Pivot Point was my first and I liked it so much. I definitely can't wait for this. Great pick! I've been wanting to check this one out as well 🙂 It sounds really good! Oooh.... sounds interesting!! I wonder which way she'll go in the end?!?! Nice choice! There's definitely been a lot more time travel/parallel universe stories lately. I definitely need to check some out sometimes haha. Awesome pick, thanks for sharing! i haven't heard of this book but cat patrick and suzanne young?! well, that is some writing duo. adding it to my wish list. I'm actually not a fan of 'alternate universes' in fiction or movies, but I've heard great things about this author so I'd love to read some reviews of this. Cool pick! Ooh nice! Thin I've seen this one somewhere before because the cover rings familiar! Hope you enjoy it! I enjoyed Sliding Doors, so I have a feeling I'd enjoy a similar story in books form. I'll have to check this out. Great pick! This one looks like an emotional story. Thanks for sharing! I keep seeing this one around. I'm still not sure if it is one I want to read or not. Waiting on a few more reviews. Thanks for stopping by earlier and sharing your WoW. This is a great pick! I love alternate universe stories, too. I've read one of Patrick's books before, and really liked it. Thanks for sharing! Hi Caro 🙂 I can't find your Swoon 🙁 I have this book from Edelweiss 🙂 I'm waiting to read and review it, when it's closer to the publishing date. I agree that alternate universes are pretty cool 🙂 Thanks for sharing! This sounds really good. Nice pick. I am a huge alternate universe fan! 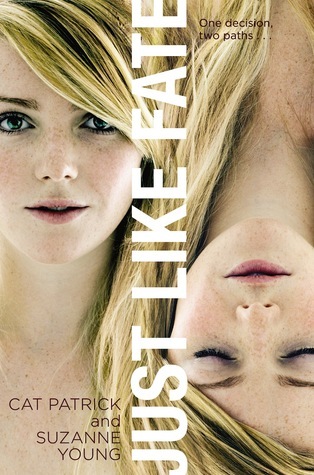 And I love Suzanne Young so clearly I need to read this one too!!! Thanks for stopping by my WOW earlier this week! I'm not sure about the splitting-universe thing, I might try it though. And I really like the cover. It seems very fitting. Thanks for dropping by our WoW!